Trismus is a common problem for people who have undergone radiation secondary to head and neck cancer. One recent study , "Impact of Exercise with TheraBite device on trismus and health-related quality of life: A prospective study" (1.25.17), looks at the significant positive impact the TheraBite Jaw Motion Rehabilitation System had on patients experiencing trismus. In the study, 15 patients began treatment with the TheraBite system between .7 and 14.8 years following oncological treatment for head and neck cancer. They engaged in a 10-week exercise program. Following the end of the exercise program significant improvement in maximum interincisal opening were observed and improved health-related quality of life factors were reported. Want more info? Click through to the study abstract or request a copy of this study. 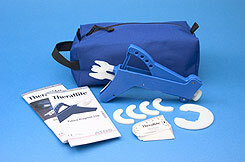 CranioRehab offers Jaw Motion Rehab Systems including the TheraBite and OraStretch press. If you treat this population and would like further information, please feel free to contact us at support@craniorehab.com or 1-800-206-8381.